It appears that I have gone on a gentle British history binge. Not that I think that British history is more worthy than any other, or more interesting. It's just that British history happens to be the one I'm most familiar with*, so when I read books from that shelf I often have a chance to go 'a-ha! ', which gives me a nice, smug sense of being knowledgeable. Or at least reasonably well educated. Great Tales From English History provided plenty of opportunities for feeling smug. No fancy scholarship and twisted details, just basic, most high-profile events, described in rather dramatised way. A good primer for anyone just beginning their adventures in the historyland. I would say teenagers are the perfect target market here, but the author claims the book was written for adults. This got me slightly worried - is the history knowledge of general population really that bad? Then I thought of all the scientific brains out there and breathed a sigh of relief. If you know how to design an engine, or cook up a cancer cure, you can be forgiven for not knowing a thing about Battle of Hastings... probably. The book itself looks pretty substantial, but it's an illusion. Actual stories take up only 220 pages, with heavy-duty paper and hardcover binding providing the 'thick' impression. English History screams from the cover in block letters, even though it's the Tales bit that really should be accentuated. When it comes to scholarship, Lacey does not make any groundbreaking discoveries. His book is well-researched and, as far as I can tell, free of serious factual mistakes, but it would not impress any historian. It's tales that matter here, coloured for dramatic effect and extremely readable. History is full of damn good stories and Lacey makes good use of the available material. Fair enough. If you want someone to fall in love with the science of history, give them a good yarn first. 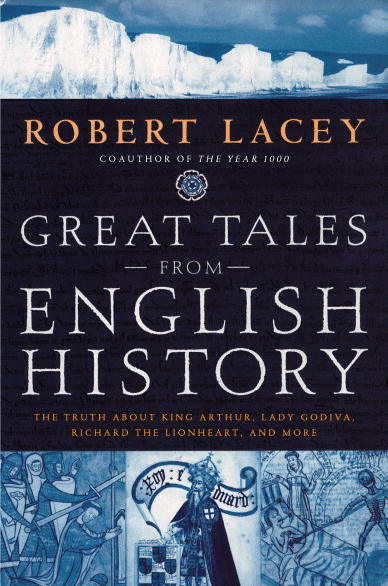 Great Tales From English History have the potential to hook a reader for life. *well, almost. I know a thing or two about the history of my native Poland as well, but there are few books written in English about that. Since 'few' does not mean 'none whatsoever' do check back in a day or so - there's a Polish history book (Polish as in 'Polish history, not 'Polish language), a pretty good one, waiting in line to be reviewed by the Bookworm.